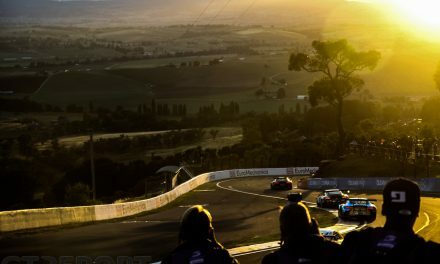 Mercedes-AMG Team GruppeM Racing has topped the charts on the opening day of the Bathurst 12 Hour, setting the fastest time of all four practise sessions combined. Raffaele Marciello doubled down on his quick lap in the second morning session by setting a 2:03.5882 halfway through the fourth and final training. 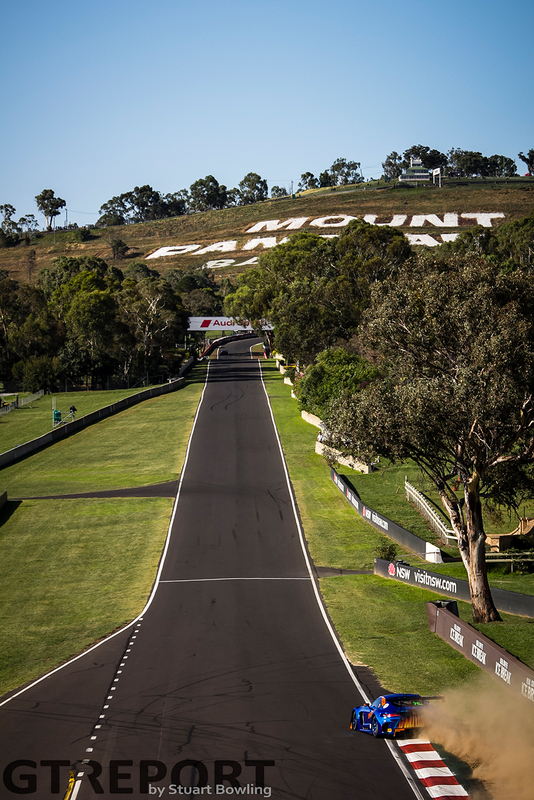 At 8:45 local time the first cars took to Mount Panorama Circuit in a session designated for all non-Class A/GT3 Plantinum and Gold-rated drivers. Mathias Lauda set the fastest time in the early morning session, clocking in at 2:06.8627 in the number 51 Spirit of Racing Ferrari 488 GT3. Immediately following the first session was the ‘free for all’ second practise. GruppeM first showed its teeth here, with Marciello getting the upperhand with a time of 2:04.9684. Tim Slade finished second in the number 27 HubAuto Corsa Ferrari 488 GT3, nearly half a second behind the GruppeM AMG with a 2:05.3650. The third training at the end of the morning saw Christopher Mies in the number 2 Audi Sport Team Valvoline R8 LMS GT3 sharpen the fastest time at that moment by 2:04.5139. The MPC-run Audi team was amongst the frontrunners all day, setting the third-fastest time in practise 2 and ending the final session of the day in eighth position. 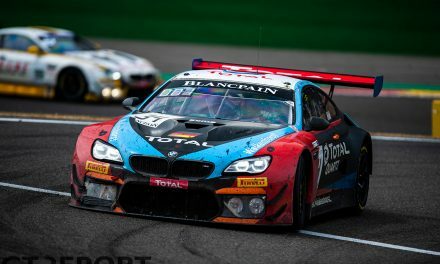 Two-time Bathurst 12 Hour winner Mies returns to the event with co-drivers Markus Winkelhock and Christopher Haase. Audi Sport Team Valvoline team-mates Garth Tander, Kelvin van der Linde and Fred Vervisch were second-fastest of the day in the number 22 sister car, completing their fastest lap of the day in 2:03.6301 in the fourth and final practise session, barely 4-hundredths behind GruppeM’s 2:03.5882. 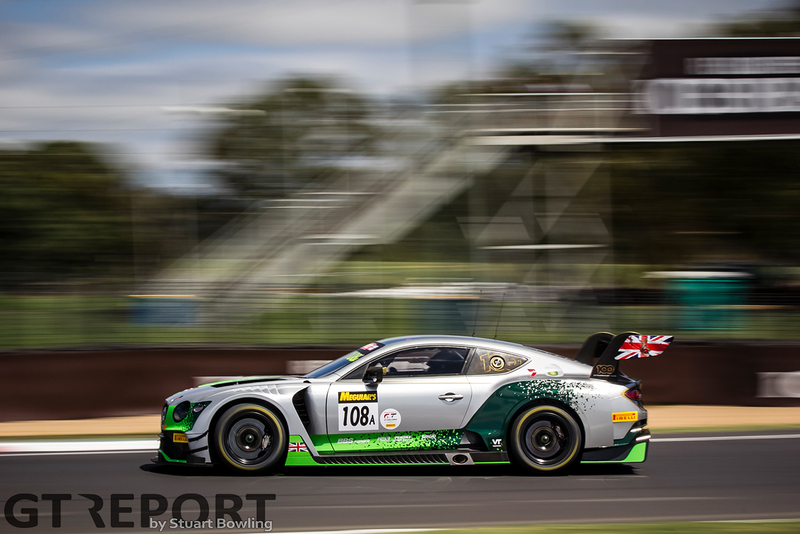 Bentley Team M-Sport (number 108, second-fastest with 2:04.7282 in practise 3) and BMW Team Schnitzer (third-fastest with 2:03.8017 in practise 4) were other heavy hitters representing different manufacturers on opening day. Friday also saw plenty of drama for a number of teams, with especially the first two sessions marred by red flags and crashes. The number 3 Audi Sport Team MPC R8 LMS GT3 became the first withdrawal of the weekend when Pete Storey smacked into the wall at The Chase. Damage done to the Audi R8 LMS GT3 was enough to take the car out for the remainder of the event, even before multiple British Touring Car Champions Gordon Shedden and Matt Neal could turn a lap. 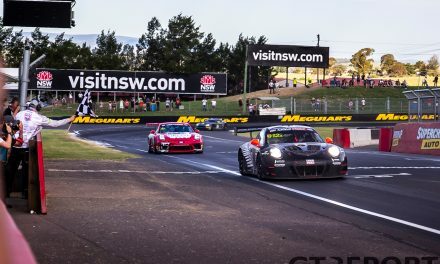 Black Swan Racing driver and team-owner Tim Pappas experienced the scariest moment of the weekend so far when he went straight through The Chase at high-speed coming off Conrod Straight. The American crashed rear-first into the wall as his Porsche 991 GT3R caught fire. The ensuing blaze prompted one spectator to jump the fence and extinguish the fire. Pappas was conscious after the accident and taken to hospital where fractures on his right arm and pelvis were diagnosed. The team has since began packing up as the car is irreparably damaged. 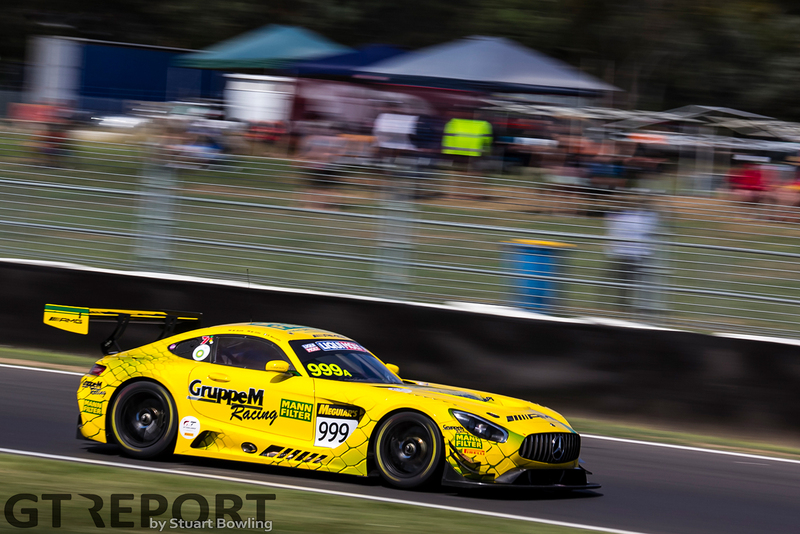 Another accident in the second training session involved the number 888 Triple Eight Mercedes-AMG GT3 of Shane van Gisbergen and number 51 Spirit of Race Ferrari 488 GT3 of Paul Dalla Lana. 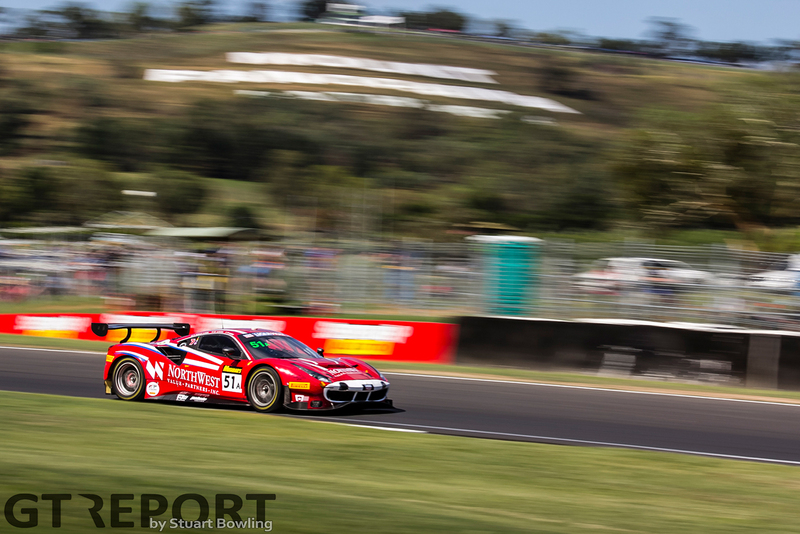 The pair made contact at the exit of The Chase when the faster Van Gisbergen attempted to overtake Dalla Lana, hitting the Ferrari in the back and sending it into the wall. 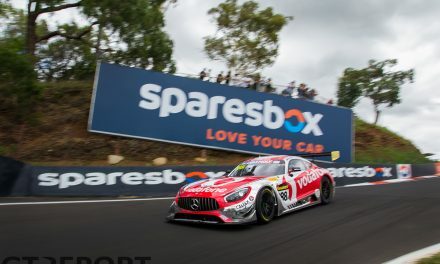 Triple Eight was back out in the third session after repairing the AMG’s splitter, while the Spirit of Race Ferrari returns on track on Saturday. The Ferrari squad, however, has received a ten-place grid penalty for ‘careless driving’ as a result of the accident. Practise continues on Saturday morning 8:35 local time (22:35 CET Friday evening) with the fifth and final practise session before qualifying starts at 11:20 (1:20 CET).